When I saw this beautiful mermaid designed by Amy Y, I just had to have her! Pearl Tidepool & Seamoor...what perfect names. They are so so adorable!! This is my first time trying the monochrome technique, I chose purple and it so much fun to do! Following the ATS and Tamiko's challenges, here's what I did. When I finished coloring Pearl I thought, why did I color her face purple??? Then I lightened it up with the blenderless pen, and it turned out better. Added stickles shine and liquid pearl to pretty her all up! Flowers are from Petaloo...after a long search thru my stuff, I finally found some glass beads that I added to the center of the flowers. Ribbon and sentiment stamp are from Michael's and dp is from my old stuff. For someone that just got into cardmaking, I have alot of old stuff! lol! I bought alot of extras when I did party and wedding favors...now they come to good use! Thanks for playing along with us at the ATS challenge this week! this is gorgeous, Mimi! Great job with the monotone! 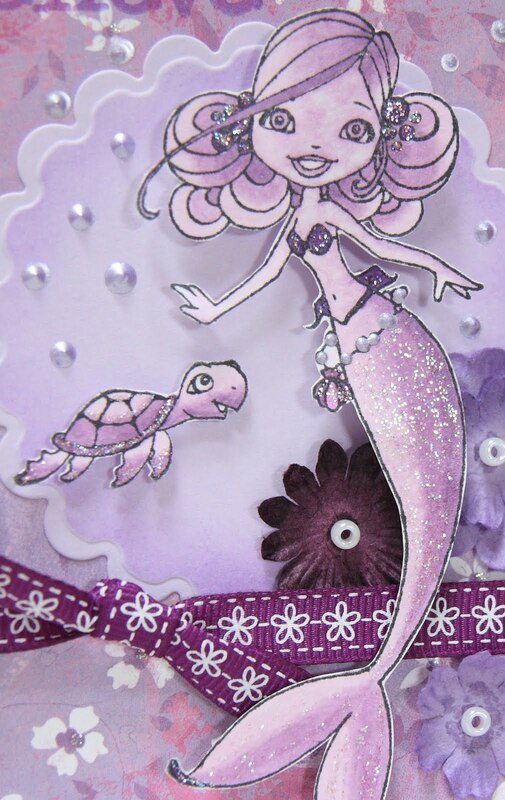 This is such a pretty card, i absolutely LOVE the coloring! and the colors are just beautiful!!! i am starting to LOVE purple/lavender!!!!! Thanks for playing, great entry!!! this is wonderful! I need to learn how to do that with my images. you did a fabulous job! so glad you entered the challenge at Tamikos! hope you have a wonderful day!